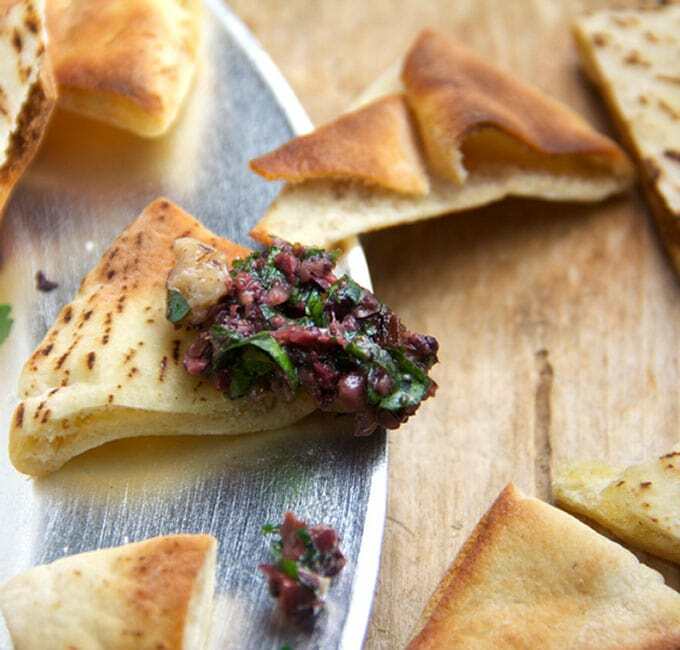 This spicy Turkish tapenade packs a big punch of flavor and is a cinch to prepare. Just a handful of ingredients and a quick blitz in the food processor you will have this wonderful dip, a perfect appetizer with veggies or pita or a delicious topping for grilled or broiled fish or chicken. 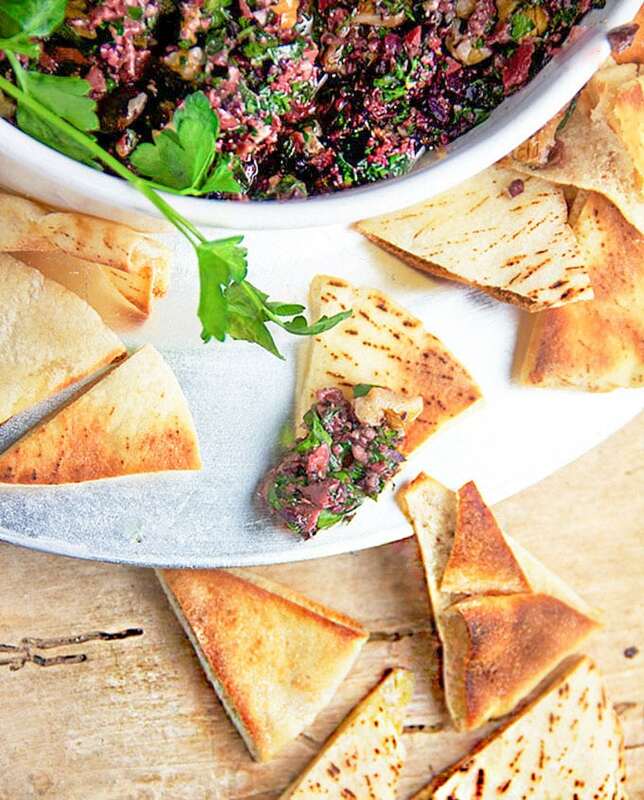 This Turkish-inspired version of black olive tapenade is jazzed up with garlic, a variety of spices, parsley and walnuts. It takes just 15 minutes to throw together and the flavors are exciting! I’ll make this for a special occasion or even just for a random Friday night when my husband and I have no plans. I love to mark the end of the work week with something special and celebratory like this – something that goes well with my favorite cocktail or a glass of wine. I adapted this Turkish tapenade recipe from a really fun cookbook that a friend gave me called Bought, Borrowed & Stolen. The author, Allegra McEvedy, is a world traveller, chef and collector of knives. In this book, she takes the reader on a journey of the countries she’s visited, sharing details and photos of the interesting knives and fun recipes she acquired along the way. 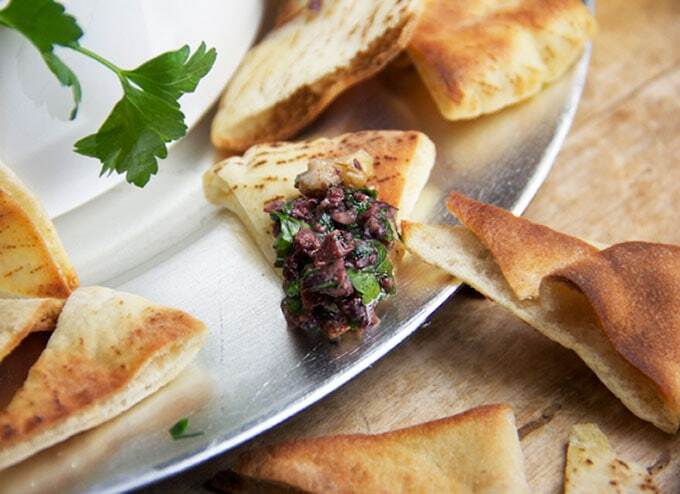 You’ll need something to dip into your delicious Turkish tapenade. Store bought crackers or pita chips are perfect, or if you want to make your own pita chips, it’s not hard. Cut some pita bread or mini pita (what I used here) into triangles, put them onto a sheet pan, brush them with olive oil and toast them under the broiler for a couple of minutes until they start to brown. Flip them over with a spatula and leave them under the broiler for another minute or so, watching carefully so they don’t burn. As I mentioned earlier, this tapenade also makes a delicious topping for simple grilled or broiled chicken or fish. 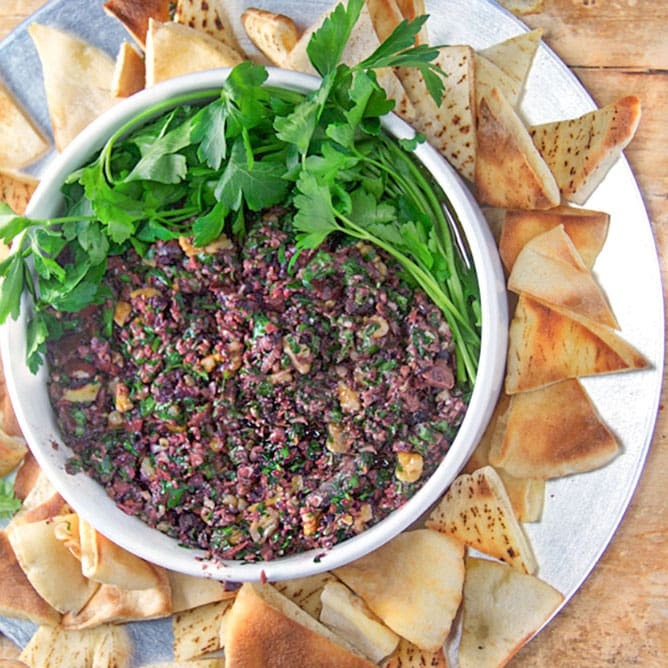 Here’s the Turkish tapenade recipe. If you try this I hope you’ll come back to leave a rating and a comment. I’d love to know what you think. A flavorful puree of olives, walnuts garlic, lemon, herbs and spices. This quick, easy dip is delicious as an appetizer or topping for grilled or broiled fish or chicken. Roughly chop the walnuts by giving them a few pulses in the food processor. I like to leave them in fairly large chunks. Pour into a bowl and set aside. Add olives, garlic and spices (chili, cumin, coriander, oregano and sumac) to the bowl of the food processor and process for a few seconds until the olives and garlic are finely chopped. Add oil and lemon juice and process for a few seconds more to combine. Transfer the mixture to a bowl. Stir in walnuts and parsley. Season to taste with salt and fresh ground black pepper. Serve with crackers or toasted pita. On occasion I provide links in my posts to cookbooks or other products, available for purchase on Amazon. If you purchase a product through these links, a small commission goes to help support Panning The Globe, with no extra cost to you. This looks delicious. I’m pinning this for later. I’m stopping by from Google + and the Delicious Recipes community. Thanks so much for joining us.